A stalking fourth heading into the far turn, Pubilius Syrus wheeled four-wide turning for home and went on to defeat 6-5 favorite Inscom by a head in Friday’s $75,000, Eddie Logan Stakes for 2-year-olds at one mile on turf. Owned by Holly and David Wilson and trained by Vladimir Cerin, Pubilius Syrus got the distance in 1:34.58. Second in the Grade III Cecile B. DeMille Stakes at a mile on turf Nov. 26, Pubilius Syrus was off as the 9-5 second choice in a field of eight sophomores and paid $5.80, $2.80 and $2.40. A maiden winner over the course and distance two starts back on Sept. 30, Pubilius Syrus notched his first stakes win and is now 6-2-1-1 overall. With the winner’s check of $46,440, he ends 2017 with earnings of $112,140. The Logan, named for Santa Anita’s iconic shoeshine attendant, who worked at Santa Anita from its inception on Christmas Day, 1934 until his passing at age 98 in January of 2009, touched the hearts and minds of thousands over the years, including Cerin. Ridden by Flavien Prat and trained by Simon Callaghan, Inscom got a perfect tracking trip and was a close third heading into the far turn. Three-wide turning into the stretch, he did everything but hold off the winner late, finishing 1 ¼ lengths in front of Choo Choo. Dispatched as the 9-5 favorite, Inscom paid $2.80 and $2.40. 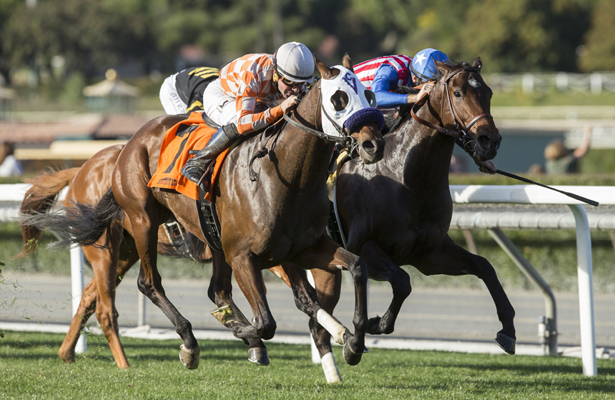 Choo Choo, who sat second to pacesetter Magic Musketier into the far turn, proved third-best under Mike Smith, finishing 1 ¼ lengths in front of longshot Blended Citizen. Off at 5-1, Choo Choo paid $3.00 to show. Fractions on the race were 22.32, 46.89, 1:10.88 and 1:22.79.